On booking a £100.00 deposit, plus £75.00 security deposit (security deposit refundable within 14 days if no damage or items missing after your departure) Balance to be paid 8 weeks prior to your holiday. If booked in the 8 week period full payment required. We book 3 nights check in 2pm Friday check out 10am Monday. 4 nights check in 2pm Monday check out Friday 10am. 7 nights check in 2pm Monday or Friday, check out Monday or Friday 10am. Only exception is the School Summer holidays which are Saturday to Saturday only. See calendar for 2019 availability. Haven is a Family friendly park, designed for families and couples and have a set of Park Rules, which we abide by. No Hen or Stag parties or similar groups. 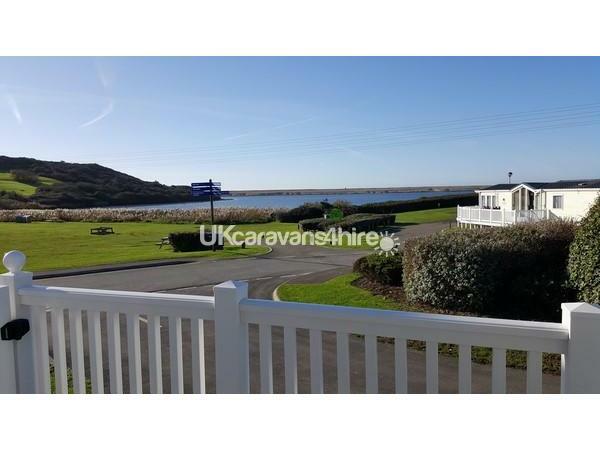 Welcome to our privately owned 2017, Three bedroom Willerby Avonmore Caravan (sleeps 6) On Havens Award winning 5 star holiday park at Littlesea Weymouth. 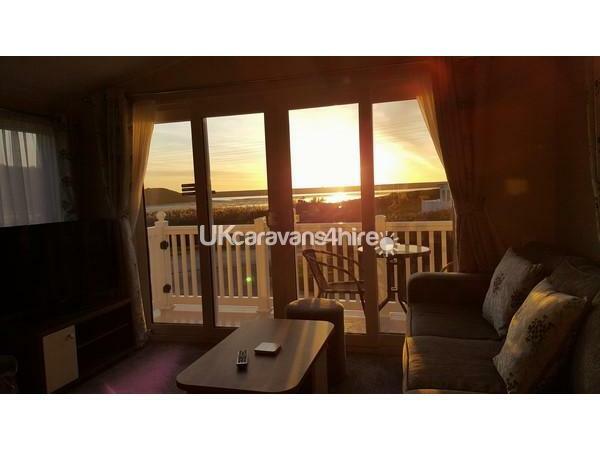 Our caravan is classified by Haven as Prestige Sea View with Decking and is located on the front row of Swan View giving fantastic views over Fleet Lagoon to Chisel Beach and is a 3 minute walk to the main park reception and entertainment areas. 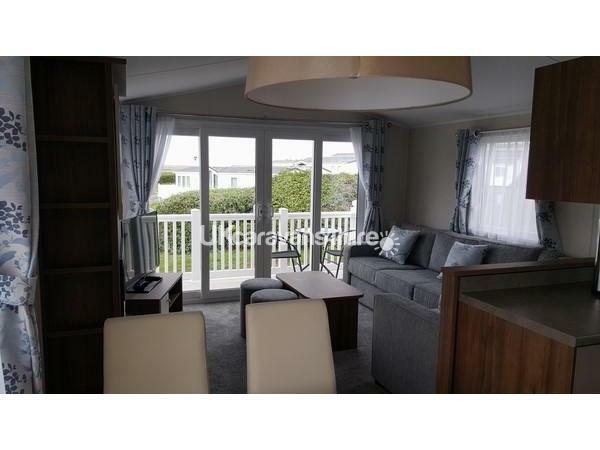 We have 3 bedrooms 1 x double with en-suite toilet and 2 x twin rooms. There is also a separate toilet and shower room. 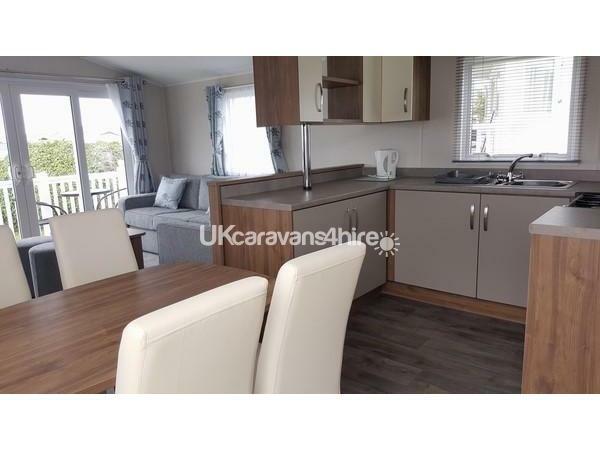 The caravan is fully centrally heated and double glazed. The kitchen and dining area has a free standing dining table and 4 chairs plus 2 stools in the lounge if needed. 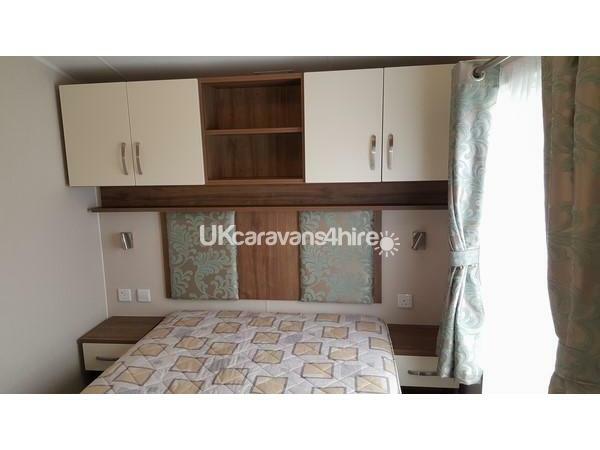 Integrated fridge/freezer, gas cooker, microwave, toaster, kettle, cutlery, glasses, mugs, plates to cater for 6 people. In the lounge there is a 40inch Freeview TV with in built DVD player, with a selection of children's DVD's. Coffee table, electric fire and seating perfect for looking out at the sea view. The sliding patio doors lead to decking with a bistro set. 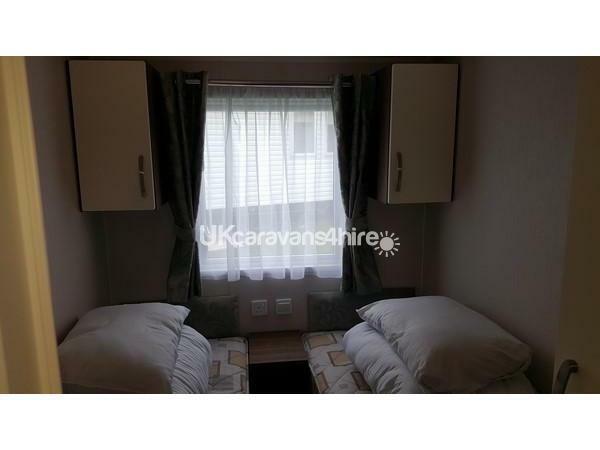 To the side of the caravan there is additional seating with a picnic table and bench. beach and so many more attractions. This is strictly a no smoking caravan. Fantastic Caravan and Location. 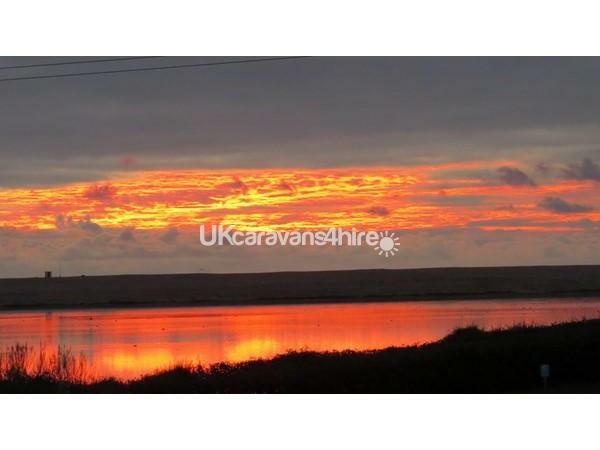 We have just spent a wonderful Easter weekend at this caravan, its location overlooking the Lagoon and Chesil Beach is stunning with coastal walks on your doorstep. The caravan is close to all the park amenities yet far away enough not to be disturbed. 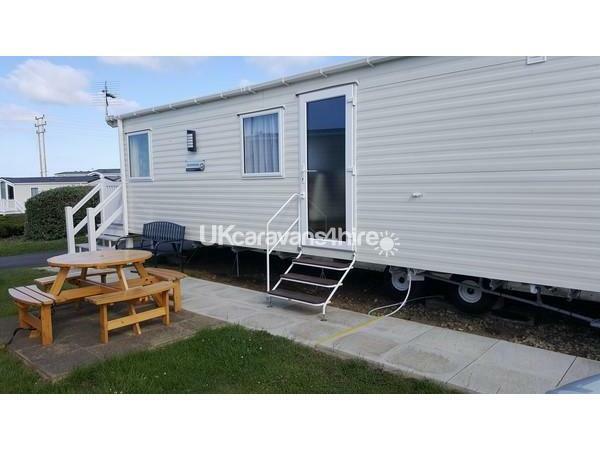 If you want a chilled out or fun weekend then this is the caravan for you we cannot wait to go back . Thank you. 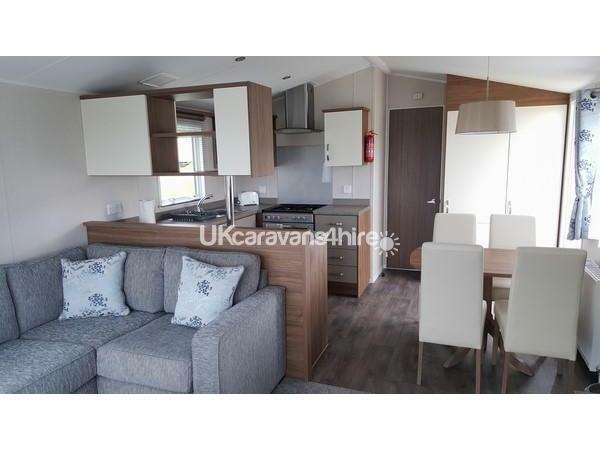 A fantastic caravan offering everything you need. Panoramic views of the coastline and countryside. We enjoyed spectacular sunsets whilst sitting on the patio. I could find nothing to fault. 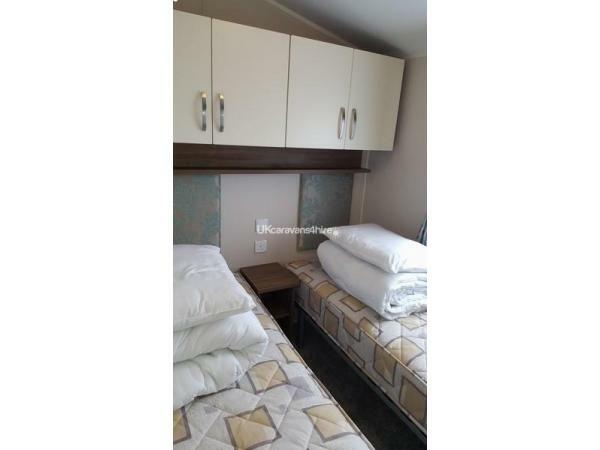 The bedrooms all have plenty of storage, the two twin bedded rooms also have under bed storage for holdalls/bags. 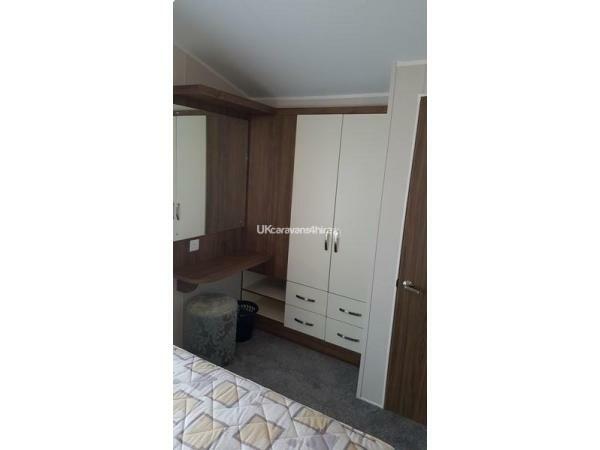 The master bedroom was very comfortable with the advantage of an en suite. There is a door to the bedroom/bathroom corridor. Our grandchildren joined us for the weekend so when they were in bed we were able to close it so we did not disturb them. We liked the fact the kitchen is to one side of the caravan. You did not have to walk through the kitchen to get to the lounge. Great when you are cooking with little ones about! The lounge had plenty of comfortable seating and also a dining room table and chairs. I totally recommend this caravan. To endorse my recommendation I will be booking again this year.